GoPro's Hero3 Black Edition is easily one of the most interesting video cameras of the year—and not only within the helmet-cam category. If you were hoping for big advances in video imaging, here they are, and they are impressive indeed: an advanced sensor capable of shooting 1080P footage at 60 frames per second, or 2.7K Cinema at 30 frames per second, or an incredible 4K picture at 15 frames per second, all of it captured using an innovative hybrid RAW codec called Protune. And these future-is-now features come to us not from Sony's or Canon's professional department, but rather from plucky little GoPro, helmet cam maker extraordinaire. Along the way, GoPro gives us a brand new lens to better realize the new sensor's capabilities, and GoPro has also shrunk the whole package, making it smaller and lighter than its predecessors, Heroes one and two. Let's sidestep the advances for just a moment, and note that, if you don't much care for mucking about with 4:2:2 pseudo-RAW codecs in larger-than-HD resolutions, the Hero3 Black Edition will happily function exactly the same as the Hero2. It will produce a noticeably better picture, but other than that, there is nothing here to scare you. Everything looks and works the same. But...we're not paying an extra hundred dollars here for nothing. For those who want to dive into the camera's deeper functionality, be prepared to be dazzled. GoPro's new sensor delivers vastly better low-light performance. You can actually dig details out of the shadows without destroying the image's integrity. That also means functional latitude is much better. The new lens is absolutely sharper. And then there is the switchable Protune mode (long explanation here), which when active cleverly embeds a coded 4:2:2 log-based signal in a standard 8-bit MP4 wrapper. Decode it using Cineform's free Studio software, and you've got a robust and data-rich stream wholly suitable for professional post-production color grading. Combine the GoPro's Protune mode with one of the higher resolution settings, like 2.7K, and you get a simply ridiculous amount of resolution that is marvelously free from aliasing, noise, and other artifacts. In fact, aside from fish-eye lens distortion, you'd probably be hard pressed to find anything priced less than $4000 offering a remotely equivalent picture. If we could somehow put a Zeiss lens in front of this sensor, the Hero3 would be competitive with $10K production cameras. There are a few concerns. First and perhaps most significantly, that new sensor and reduced overall unit size translate into a much higher load on a much smaller battery. 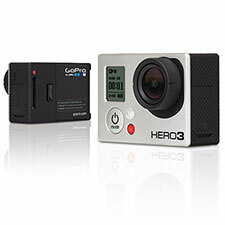 Compared to the Hero2, the Hero3 is a power-gobbling monster. Carrying extra batteries will be mandatory for any kind of extended use—even a modest few hours of on-and-off shooting. That makes the Hero2 far from obsolete for many users. If the Hero2's good-but-not-great image is good enough for you, stick with it. Professional filmmakers will find much to love about the Hero3's deeper capabilities, but in the hands of most consumers, Protune functionality adds time-consuming conversion and editing steps of arguably little ultimate value. In a way, the Hero3 gives us a replay of the RAW-vs-JPEG debate, only now transposed to the realm of consumer video. Many people shoot RAW with their DLSR's more for the pleasure of the greater editing power than the ultimate result, and I expect many video shooters will do the same with Protune. In any case, it is remarkable that GoPro is now leading the way when it comes to prosumer video.